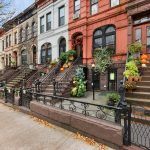 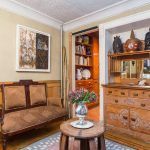 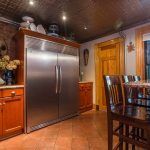 On one of the prettiest blocks in the landmarked Stuyvesant Heights section of Bed-Stuy, this 3,240-square-foot 1890s brownstone is brimming with historic architectural details. 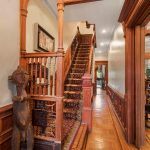 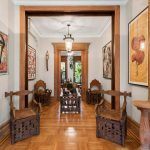 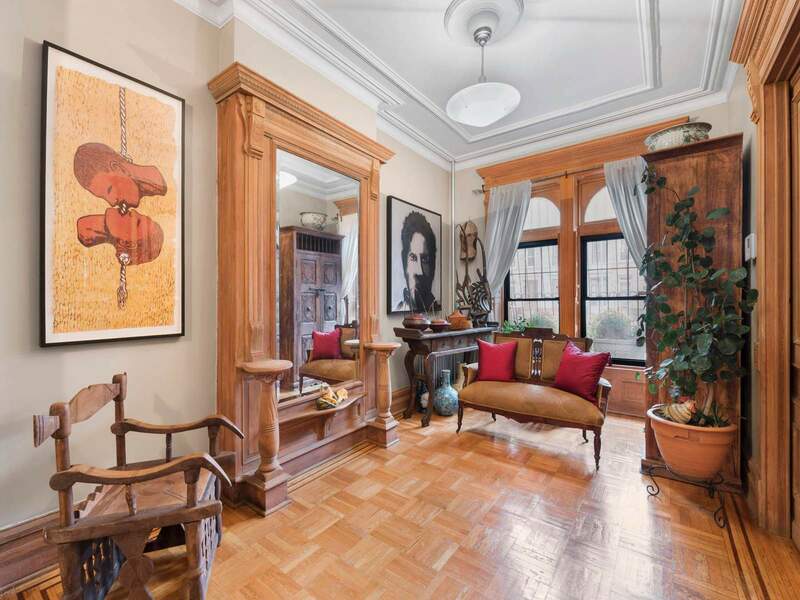 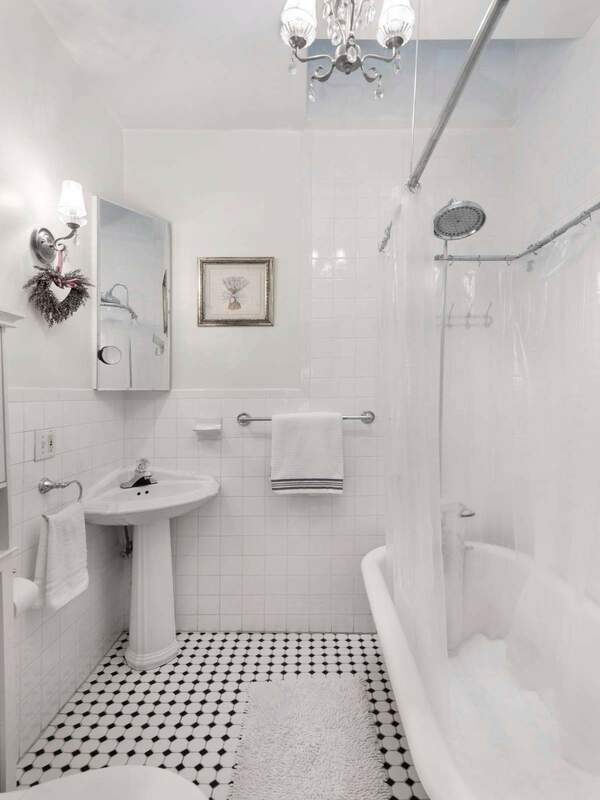 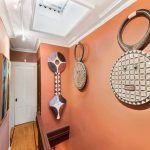 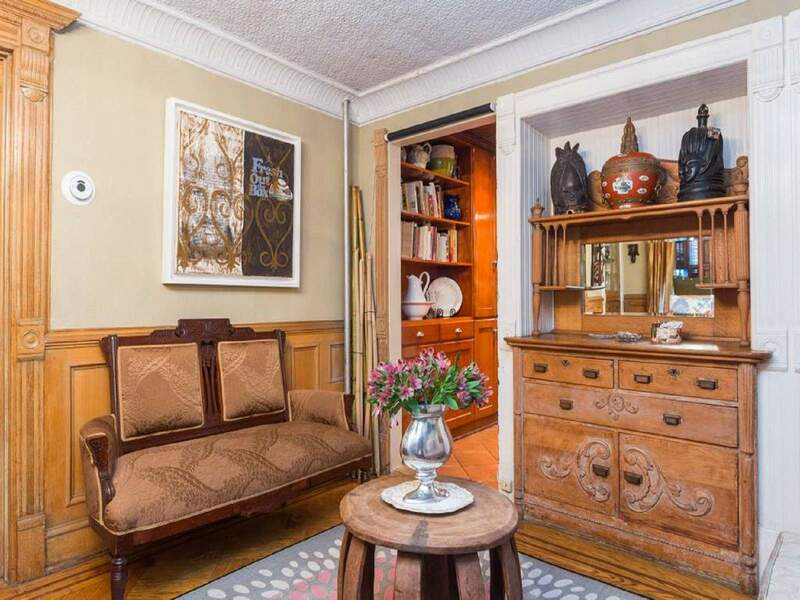 Designed by prolific Brooklyn architect Amzi Hill, 740 Macon Street has been lovingly restored by the home’s longtime owners, one of whom happens to be a celebrated local artist whose sense of history and beauty is reflected at every turn. 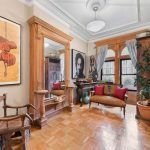 Highlights include arched windows, six tiled fireplaces, parquet floors, wooden shutters, pressed tin ceilings, pocket doors, a pier mirror, egg-and-dart molding and intricate fretwork, plus a landscaped garden and terrace. 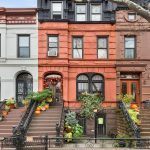 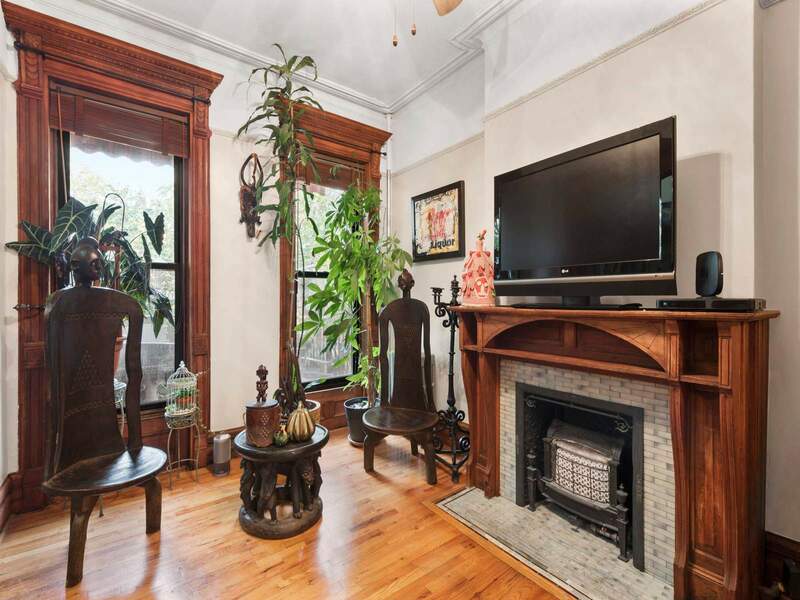 The two-family townhouse–there’s a one-bedroom garden unit for rental income–is asking $2.3 million. 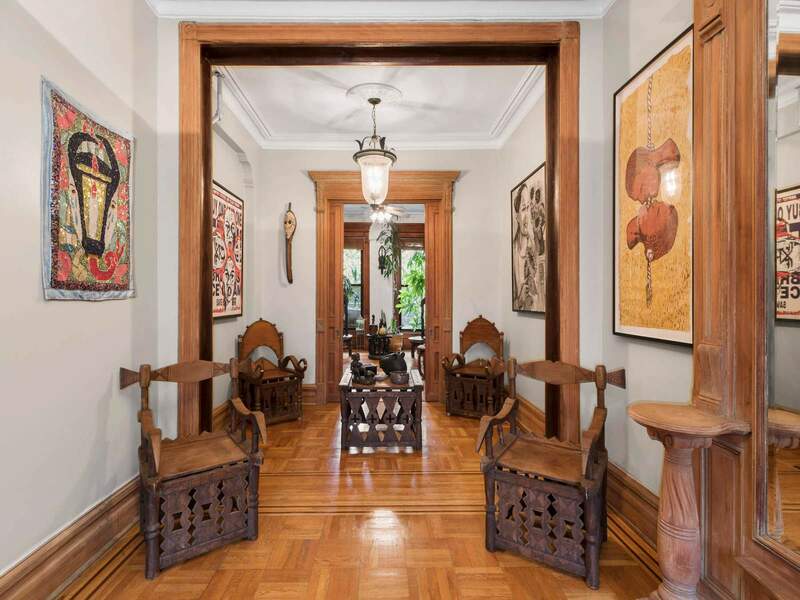 The home is currently configured as an owner’s triplex with a separate garden level apartment. 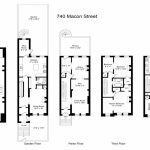 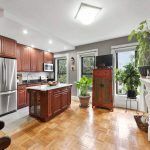 That’s often the ideal setup in a townhouse, but here the owners’ top floor kitchen is a bit of an awkward placement, and the garden level’s kitchen that opens onto the gorgeous backyard seems a shame to give up. 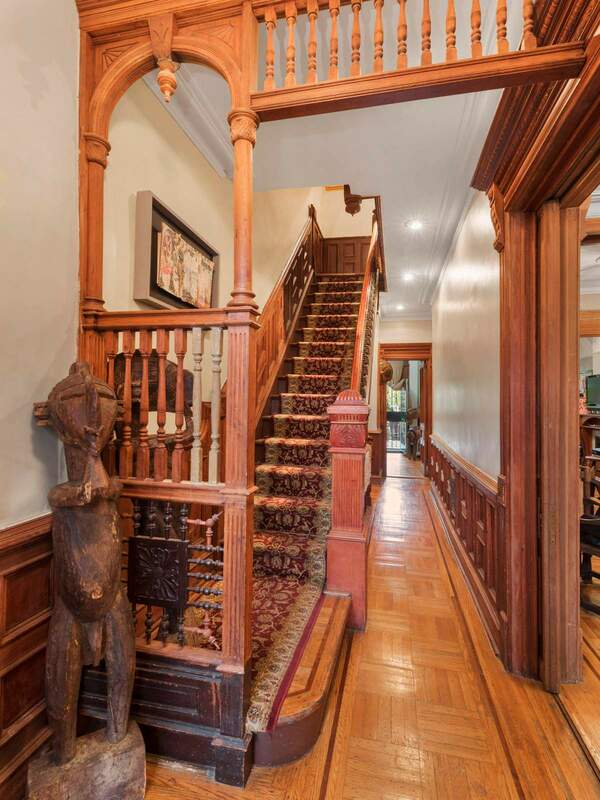 Enter the upper triplex on the parlor level to ceilings of over 10 feet in the living room, den and library. 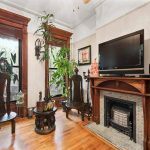 A cozy fireplace, restored original details and access to a 250-square-foot terrace make the whole floor a great space for entertaining. 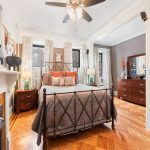 One floor up you’ll find the grand master bedroom with a fireplace, two additional bedrooms and a full bath. 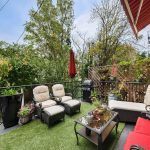 On the home’s top floor, lit from a stained glass skylight, an open kitchen takes advantage of the elevated space offering beautiful treetop and garden views. 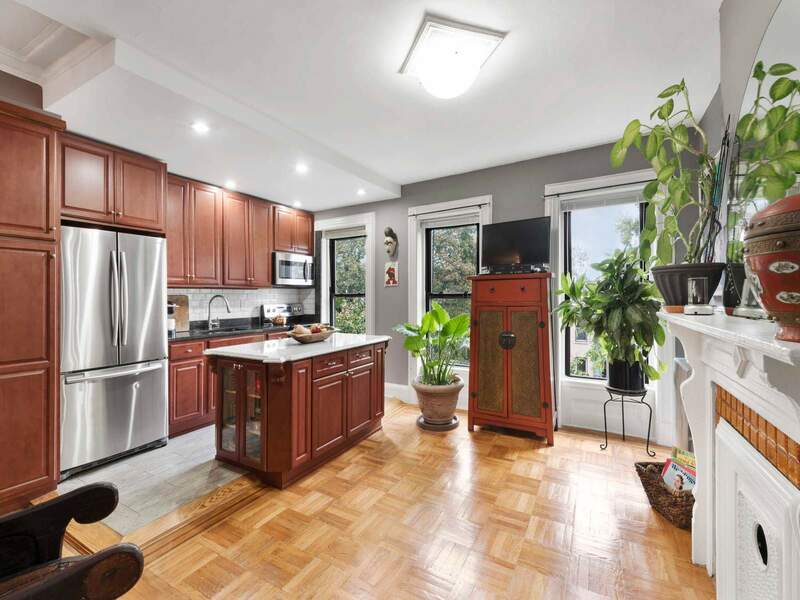 The kitchen boasts granite countertops, stainless appliances and a fireplace. 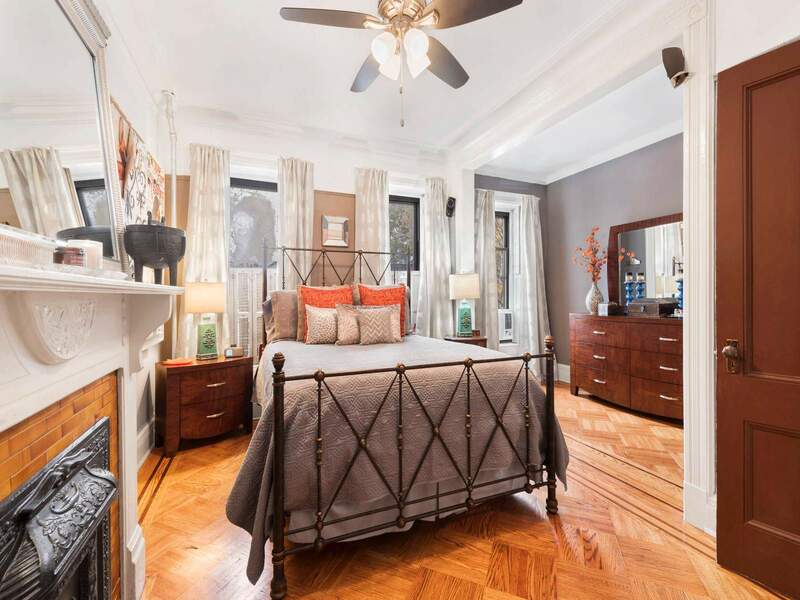 Also up here are two additional bedrooms and another full bath. 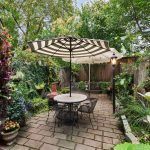 The garden level boasts a lovely “living room/bedroom” with built-in cabinetry, another fireplace and a full bath. 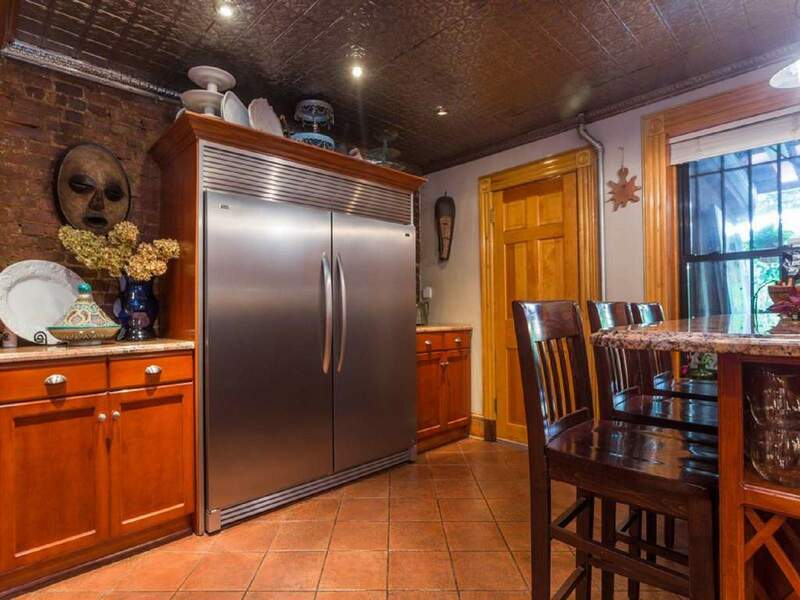 A rustic chef’s kitchen has an apron-front sink, stone countertops, and stainless appliances. 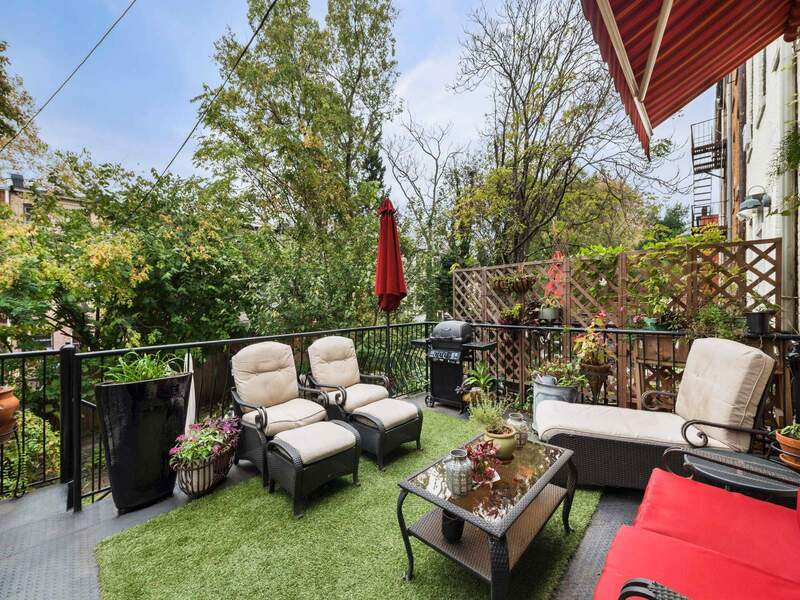 The best thing about this floor, though is the 800 square feet of greenery and open outdoor space with mature plantings and slate stonework just outside the door. 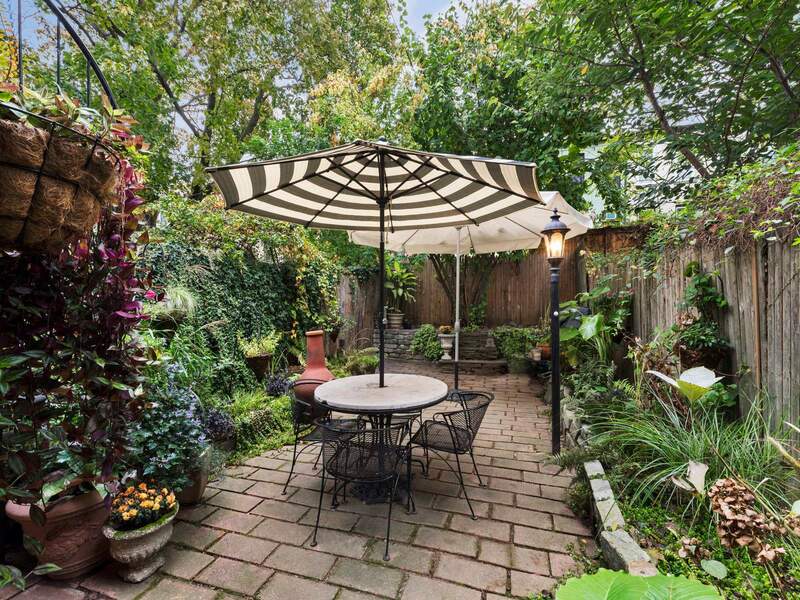 An adjacent mud room makes garden enhancement that much easier. 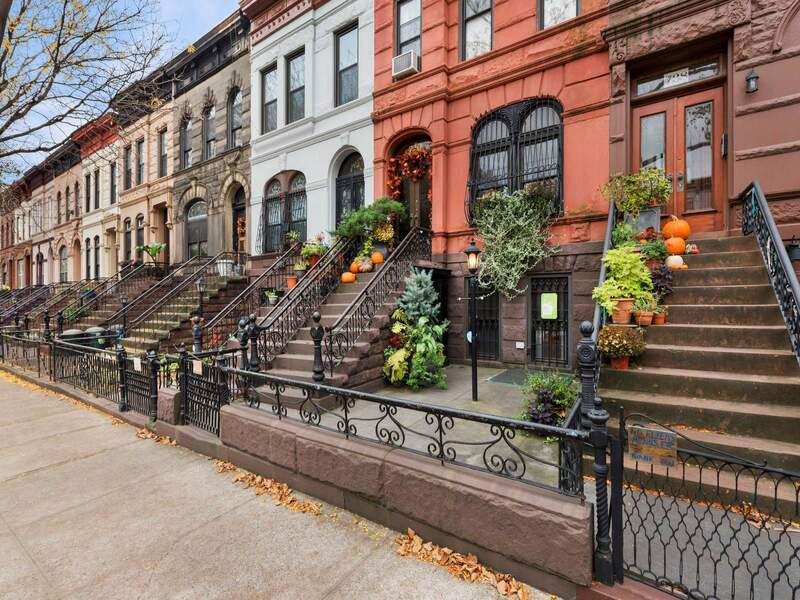 Images courtesy of Sotheby’s International Realty.